Armistice Day marks a century since the end of the Great War. But it was a peace that did not last. Bruce Munro asks ‘‘Why?’’, ‘‘Has anything changed?’’ and ‘‘What role could New Zealand play in the future of war and peace?’’. There are some disturbing similarities between the world leaders who failed to keep peace a century ago and those of today, Robert Patman says. The professor, a sought-after international relations specialist, sits at an oversized desk in his book-lined, University of Otago office where he has been busy marking students' end of year exams. "Sometimes technology outpaces decision-makers' ability to keep up with it,'' he says definitively. World War 1 saw important and terrifying new technologies, such as tanks and machine-guns. But the military tactics the leaders pursued were locked into 19th-century thinking, Prof Patman says. The same disconnect was reflected in diplomacy after the war ended. Partisan, naive and protectionist policies led, almost inevitably, to a fresh world war just two decades later. One hundred years on, "we are seeing comparable developments'', Prof Patman warns. "We have a group of decision-makers - Putin, Trump, the Brexit leadership in Britain - who really are quite nostalgic in their political vision. Partisan, naive and protectionist policies are once again on offer. Their disconnect with the contemporary world is striking, he says. World War 1 ended with the decisive defeat of Germany. At the 11th hour, of the 11th day, of the 11th month, of 1918, the guns fell silent after four years of war that had killed up to 20 million people and injured a further 23 million. It was supposed to be the "war to end all wars''. But from the beginning, world leaders let peace slip through their fingers. US President Woodrow Wilson helped negotiate the peace treaty. 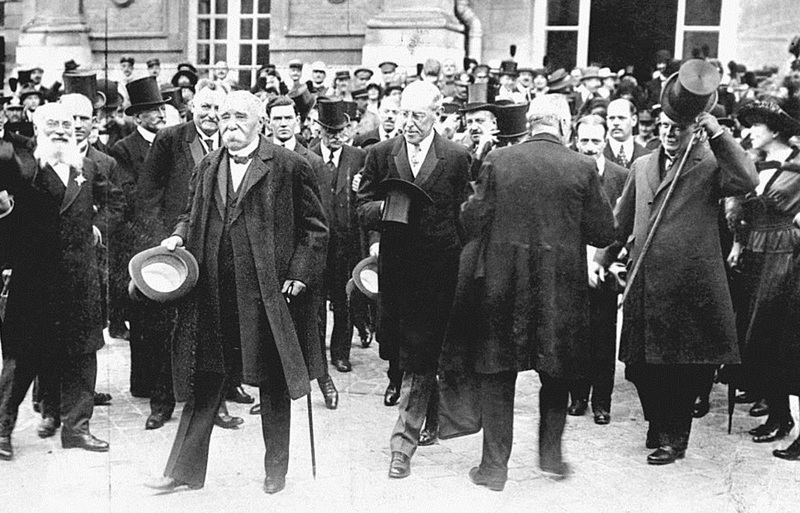 But his determination that Germany should be treated magnanimously fell on deaf European ears, especially those of French president Georges Clemenceau, who wanted revenge. Then, perhaps suffering brain damage caused by a bout of the deadly Spanish Flu, Wilson capitulated to demands for harsh punishment. "Diplomacy still had the mindset of the 19th-century,'' Prof Patman says. "There was severe punishment of those deemed to have caused the conflict, without taking into account that this would perhaps have grave knock-on effects. "It wasn't in keeping with integrating them back in to the international system. It was not the way to treat a country if you wanted democracy rather than autocracy to flourish, Prof Tom Brooking says. The renowned University of Otago history professor says a lack of commitment to the newborn League of Nations also undid efforts to avoid a future international conflagration. President Wilson had taken a leading role in the establishment of the League. He wanted it to be an international organisation that would help ensure "political independence and territorial integrity to great and small states alike''. But the President's own Senate blocked the US joining the League, denying the organisation one of its most powerful potential players. "It was only a convenience when it was set up,'' Prof Brooking says. War stalked the world stage with no effective means to stop it. World War 2 killed up to 80 million people, including up to 55 million civilians. Fighting finally stopped in September, 1945. This time things were done differently. It helps explain why we have had more than 70 years without world war. The Marshall Plan, set up with US leadership, ensured that the defeated Axis Powers were helped to rebuild. "That is how Germany and Japan went on to become major industrial powers again,'' Prof Brooking explains. Other countries also felt the peace-giving effects of rising living standards. Throughout Western democracies, from the 1950s into the 1970s, (and for the first time in history) capitalism delivered benefits widely. Technology growth has also helped keep the peace, Prof Brooking says. Television, air travel, the internet ... it has all turned the world into a global village. "It has made it a lot easier to manage international communications. Prof Brooking and Prof Patman agree the prospect of nuclear annihilation also kept world war on the back-burner. Three times since World War 2 the planet has teetered on the brink of nuclear war, Prof Patman says. But each time, the "nuclear paradox'' meant both sides backed away without pressing the button. "It's a paradox because, on the face of it, these two superpowers, the United States and the Soviet Union, had more power than any great powers in history before them. THE first, and closest call, was the Cuban missile crisis, in October, 1962. Eleven years later, in October, 1973, nuclear war again loomed large when an Arab coalition led by Egypt launched a surprise attack on Israel. The Israelis were supported by the US, while the Soviets backed Egypt. On October 24, US President Richard Nixon put his country on nuclear alert and signalled to the USSR that bringing in its troops would start a nuclear war. Within 24 hours, there was a peace resolution. He says the third moment nuclear war was averted did not come to light until more than a decade later. In November, 1983, North Atlantic Treaty Organisation (Nato) member countries held military exercises off the coast of Norway. Relations between the US and the Soviets were already strained. US president Ronald Reagan had recently labelled the USSR the "evil empire''. The USSR leadership, under Yuri Andropov, believed the military exercises were a cover for a planned pre-emptive strike. It took more than a week for them to conclude the exercises were genuine. It was not until the mid-1990s, after the end of the Cold War, that it became public knowledge that for those seven days the USSR had been on nuclear alert. THE biggest danger now lies with rogue nuclear states, such as North Korea, Prof Brooking says. There are also other "festering sores'' such as the Middle East, which "thankfully, so far, haven't grown beyond civil or internal wars''. Today, there are 32 wars across the planet. Only two of them are between nation states. The rest are intra-state, internal, conflicts. After the Cold War, there had been real hope that the United Nations would finally be able to fulfil its potential to create a more peaceful world. US and USSR co-operation, in 1990, to liberate Kuwait after it was invaded by Iraq's Saddam Hussein made it look as if that dream could be realised. "But in many respects, that was the last gasp of the Old Order, rather than the beginning of a New World Order,'' Prof Patman says. Intra-state conflicts increased. The UN proved ineffective in dealing with them. Five permanent members of the UN Security Council, the P5 - the US, United Kingdom, Russia, China and France - have the right to veto any resolution. Look at what has happened in Syria, he says. What was a civil war has escalated. Because repeated resolutions aimed at forcing Syria's dictator Bashar al-Assad out of power have been vetoed by Russia, often with the support of China. It is a tragic example of the UN's predicament - the global body formally charged with the process of maintaining international peace and stability cannot really do its job. And it is not just the Russians, Prof Patman points out. The US blocks any moves to bring peace in the Middle East that they believe would undermine the interests of their ally, Israel. The UN Security Council is dysfunctional, he concludes. All states now face problems that can only be solved internationally. But the UN is a creature of the post-World War 2 era. And some world leaders, such as US President Donald Trump, are also harking back to a long-gone, pre-globalisation world. What is needed is for countries like New Zealand to speak up, Prof Patman believes. New Zealand has always seen itself as a good multilateral player, a good international citizen. But it has always looked to the British and the Americans for leadership. "I think, increasingly ... a country like New Zealand should not shy away from defending the international, rules-based system, because the alternatives, for the majority of countries, are worse. Another voice saying New Zealand has an important role to play in the future of war and peace is that of Thomas Nash. Thomas Nash is an adjunct politics lecturer at Massey University and co-founder of The New Zealand Alternative. The New Zealand Alternative aims to be a research and advocacy organisation pushing for New Zealand to have a "truly independent, values-driven foreign policy''. The other three co-founders are expatriate Kiwis, Oxford academic Max Harris and John Hopkins University international relations professor Nina Hall, and ActionStation director Laura O'Connell Rapira. Last week, The New Zealand Alternative released a report on global conflict prevention and the role this country could play. International conflicts have become increasingly complex, Nash says. Often, there are several armed groups with divergent aims in the one conflict zone. Armed conflicts are increasingly enmeshed in international crime. The Taliban, in Afghanistan, for example, controls global heroin production. And Mexican drug cartels, which control cocaine production, have heavily armed forces that are tantamount to private armies. Conflict and violence has always been driven by competition for power and natural resources. But this is likely to escalate with climate change, Nash says. "The impact climate change will have will be massive. It has already been seen in the way drought was a driver of the war in Syria. Retreating glaciers at the sources of rivers that are vital to India and Pakistan - nuclear-armed states that already have a tense relationship - hold dangerous potential. Nash says new solutions are needed. The world requires a radical shift from competition and extraction to co-operation and regeneration. New Zealand could play a vital role, he believes. His organisation wants this country to become a living example of that alternative. It also wants to see New Zealand establish an independent conflict prevention unit that could work worldwide. "Conflict is changing very significantly. There is a need to analyse and understand the drivers of conflict. We are small, not strongly aligned with super powers, practical and non-threatening. "New Zealanders, by their presence, reduce tensions rather than escalate them. Given the state of the world, is Nash's vision of a more peaceful world realistic? Radical change never seems realistic until it happens, he responds. The end of apartheid in South Africa did not seem likely until it came about. The same with Trump and Brexit. It could go either way, he admits. "We are going to have a turbulent period ahead. "Is it realistic that we go in this positive direction where we set up systems that drive towards co-operation and social cohesion, and away from violence and armed conflict? Yes, I think it is realistic. "Is it realistic that we go down another road of populism and back to dictators and highly militarised societies? I think, yes, that's also realistic.